Who could have guessed Negan scrubs up this well? Tonight’s episode of The Walking Dead delivered one of the show’s most chilling scenes to date, and it had nothing to do with blood or the undead! After Negan took Carl on a haunting tour of his home, things wrapped up with the villain taking baby Judith in his arms and telling the youngster that he may very well kill him and his father to embrace life in the suburbs. Now, a first look at next week’s midseason finale has been released, and it points to things going from bad to worse. 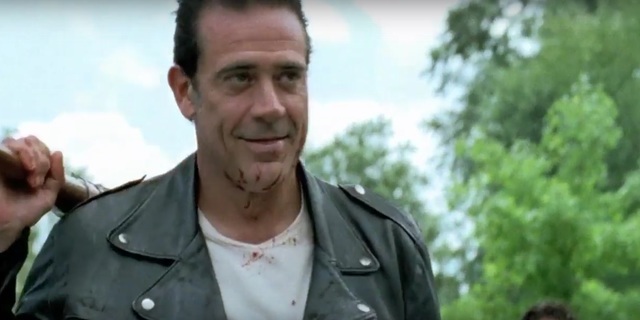 Negan has shaved off his beard (meaning Jeffrey Dean Morgan looks exactly like his comic book counterpart), and based on the blood splattered across his face, there’s a very good chance that a certain someone will meet their maker here. Despite arguably being better than it’s ever been, The Walking Dead has suffered a drop in ratings which has seen its viewership return to season three levels (a year which was widely considered to be the show’s worst). Many are blaming that on the violent – and divisive – premiere which saw Negan take out two fan-favourite characters in a horrible fashion. Whether or not that will lead to some changes moving forward remains to be seen, but the standalone episodes which are slowing things down wouldn’t be missed! We’ll have to wait and see, but for now, you can see a promo/clip from next week’s The Walking Dead below. Previous articleMarvel’s Luke Cage will return to Netflix for a second season, and we have the teaser to prove it!